This song is my very favorite from “Phillips, Craig and Dean”. It’s been around for several years now – and I never get tired of its simple beauty. When I think about “God’s Light” shining down on me – I am reminded of how very dark it is without any light, especially walking along at night with no street lights or moon. And away from the city it seems even darker – pitch black and still. But with a little light as dawn starts to break – everything suddenly appears as it is lit up and things you did not know were right there beside you – are suddenly seen. So it is with “God’s Light” shining down on us personally – illuminating some very dark places in our heart – exposing them for what they are – so that we may live and be saved. His Light, Grace and Love shining down on us – forever guiding the way – saving us from ourselves, freeing us from the darkness that threatens to drown us in troubled times. And staying with us when those troubled times are dispelled by His great light. I am forever grateful for this – the beauty and majesty of His Light. Have you experienced this in your own heart and life? When was the last time you recognized His great Light shining down on you? Psalm 4:6 says this: Many are asking, “Who can show us any good?” Let the light of your face shine upon us, O LORD. The video I posted below uses ‘sky time lapse’ photography while the song is playing and lyrics are shown. It is breathtaking and very emotional. Hope you enjoy it! I love Thomas Kincaid paintings. I own a small one – of a cabin on a lake. The only reason I own it – is because I worked at a Christian bookstore, years ago and got a hefty discount on it. They are expensive – and worth every penny. 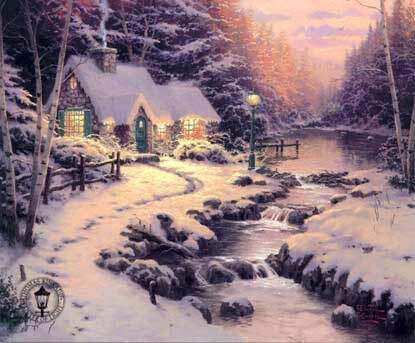 Thomas Kincaid is known as the “painter of lights” and so all of his works have lights in them – and because he is a happily married man – he has initials of his wife hidden throughout all of his paintings. Look for them sometime – it’s really fun! Last year I bought the DVD of “A Christmas Cottage” – the story of a much younger Thomas Kincaid, struggling to help his mother through bad financial reversal, and of his next door elderly neighbor – a famous painter who mentored and helped to shape ideas of why to paint to the younger Thomas. It is a story that has heart. It is about love for family and friends – a passed on legacy and memories that don’t have a price tag. I think that the behind the scenes interviews with the real Thomas Kincaid, were the most inspirational – as he shared his heart and vision for this film. It was interesting to note, that while his paintings are bright and cheery – every room in every house illuminated with bright lights – his own childhood was very dark, the house always dark when he would come home from school. It was his way of making up for the darkness of his youth – and as his mentor taught him – “always paint the light” – he did just that. If you haven’t seen this movie – I highly recommend it! Below is the story behind the movie from Thomas Kincaid himself. Last night was a very rare ‘harvest moon’ – which only appears once in several years – a full moon on the first day of fall. We noticed coming home from dessert last night in downtown Renton – that the clouds seemed brighter – and then we saw – it was the full moon peeking out from beneath the clouds. It was beautiful – and we marveled at the rare event that we were witnessing. Most of the Northwest missed this event due to the clouds – and we felt lucky to get a glimpse of it! I feel that with each passing season – there are wonders and things that are around us that we need to pay attention to – and really see. We get so busy with our lives – our worries and stresses and everyday schedules – we simply forget to look around us. There’s something magical about the moon. Always breathtaking and mysterious – a blob of light in the sky – round and constant – sometimes hidden – sometimes fully seen – but always there. I want to enjoy this season – the smells and wonders of fall. The pumpkin spice lattes – the spicy candles in my home – the fireplace lit up with crackling wood – giving warmth and character to the room – and the chill in the air reminding me of other fall seasons – and that pumpkins and Halloween – will soon be here. I love watching the leaves turn – it’s my favorite part of fall. Welcome Harvest Moon. Come back again soon. Below is a video of the beautiful song and pictures ‘When the last leaf falls’ by David Lanz. It will warm your heart and help you usher in the new ‘season’ of beauty. Had brunch today with a young couple, Brian and Debbie Fulthorp – from the Grand Canyon Park of Arizona – spending time with family here in Renton, Washington before beginning the hard task of raising their own support to become home missions status missionaries – back home. As I heard them share their great love of the people who live there – most are Indian and other mixed race – they have fallen in love with the multicultural way of living and communicating with the people who inhabit that great area around the Grand Canyon. I was impressed by the way they told stories of the lives that they have touched – and have influenced by their love and absolute acceptance. In many cases they have had opportunity of teaching and reaching one on one – with someone from another part of the world – temporarily living there – and in turn that person was so impacted that they have gone back to ‘their world’ in a totally different culture and have been able to be ‘a light’ to their people in a way that outsiders never could. I got to thinking about this thought today as I sat and listened to them sharing stories of their ministry there for the last 3 1/2 years. We are all ‘called’ to be a ‘light’ to our world – wherever we are. We don’t have to wait to get called overseas or to a local body of believers – our mission field might be the people we come into contact with everyday. We have a way with them – and more important – and understanding through time and relationship that others do not have. We are all missionaries. Those of us who have a personal relationship with Christ – are a light. And what does light do? It drives out the darkness. That’s what we are called to do – be light givers – driving back the darkness. Just a thought for all of us today – as I am challenged and renewed – are you being a ‘light’ in your world? Do others far from God feel a ‘light’ from your presence? Do you add joy and grace by just being around them? Can they feel something ‘peaceful’ and ‘loving’ about you? Do they want to be around you because they feel the ‘light’? Are you ‘contagious to them? This is what we need to be to our world around us – pointing everyone we come in contact with – to the ultimate ‘light’ – Jesus. I am praying for you today – that you would be a ‘light’ to your corner of the world. That others would be better because they know you and have you as a part of their journey. And that you would shine your good deeds before men in a way – that no one else in their world – can.